Ryan has been fishing since he was old enough to hold a rod. It might have been carp fishing in a ditch, but to a toddler it was awesome. He worked in the corporate world after college, but always stayed connected to the outdoors through sports, backpacking, mountain climbing, hunting and fishing. Over ten years ago, his passion for fly fishing drove him to become a Guide part-time while being a Dad full-time. Two-handed Spey casting for Steelhead and stripping streamers for Muskie are two of Ryan’s personal passions. His love for the sport has taken him fly fishing throughout the rivers in Michigan, across the US and into British Columbia. 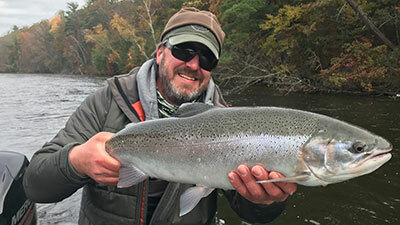 The Muskegon River, however, is a world class fishing destination for steelhead and salmon. There is nothing better than landing a fresh, silver Steelhead after a long fight on the Mo’. This is why Ryan lives here in Newaygo with his wife and two daughters.